Indoor Air Quality, or IAQ, as it is often referred to, is a term which refers to the air quality within and around buildings and structures, especially as it relates to the health and comfort of building occupants. What is “Acceptable Indoor Air Quality”? People tend to spend 90% of their time indoors. As air is circulated through a building, pollutants build up, making indoor air worse than outdoor air – up to 2-5 times worse! Pollutants can be visible or invisible and can include chemicals, dust, biological contaminants – virtually anything that can pollute indoor air. In new construction, air pollutants can reach levels as high as 1000 times acceptable levels! Everyday items can be a source of air pollution, such as pets, furniture, walls, ceilings, textiles, cleaning products, etc. Indoor air pollutants are responsible for a multitude of physical conditions, such as headache, fatique, dizziness, nausea, allergies, and asthma. In fact, cases of asthma have increased 160% in a decade. 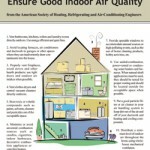 What Can TJ’s Do To Protect and Improve Your Indoor Air Quality? There are many products available to help improve your indoor air quality.